Like Steve Jobs said, life is about connecting the dots. Mom, said my son after his first psychology class in college, at your age you should decide if this is what you want to do with the rest of your life. Boom. So I made up my mind to quit my teaching job. Being an educator and an artist most of my life was like walking one step forward and one step backward. Pretty much not going anywhere. I decided to focus on art and started frantically roaming the LA art scene. Visiting as many openings as possible I traveled anywhere on the grid every possible day of the week. I met everybody. So it seemed. I grew up in Israel with the motto: One is for all and all is for one. In America I learned the motto: Everyone for himself. Judy Chicago's sense of responsibility and values reminded me of where I came from and what I had to do from now.To be grateful for one and two, like the second boom my son said, use my resources. I felt a great sense of respect and compassion for those artists who touched my spirit in one way or another in the period since I quit my job. It is my tribe, my community and I am part of it. I was not going to sit and wait for something to happen to me rather I was making it happen for all of us. After he decided to open a gallery in one of his post production facilities to support local artists and gave me the first solo exhibition there, I invited my patron to host this group exhibition. With great efforts from everyone the opening was a memorable evening and the work elevated the spirit of the place. That is how the exhibition We Are all In This Together, Do A Good Turn” came to be. 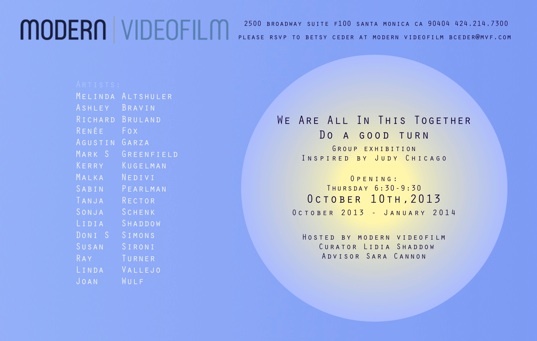 This group of artists is the seed that would multiply to a larger group as the exhibition moves to its next phase : We Are All In This Together, Reboot The Boat” as oppose to “Dont Rock The boat” from the same series of work by Judy Chicago. At this exhibition each artists would be asked to invite another artist who inspire him/her to participate and collaborate.